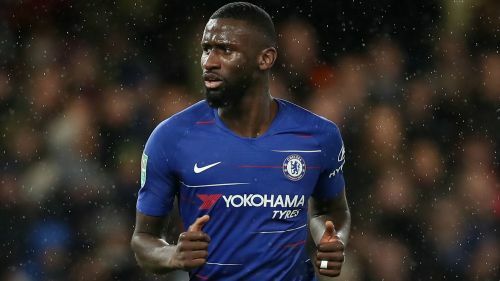 Antonio Rudiger admits "no player on Earth" would like to have been involved in Chelsea's recent poor run of results under Maurizio Sarri. Asked about the rumours around the head coach's future, he told a news conference: "I make nothing of that. At the end of the day, this is not my thing. I'm a football player, and that's it. "I'm not the coach. I'm a football player. [The system] is something the coach has to decide and we have to follow. Sarri has been criticised for perceived tactical stubbornness but Rudiger claims Chelsea's problems are more about mentality. "It's all based on results," he said. "When we had the results, no one was talking about the things we're talking about today. "We are always working in training, trying to do better each day. I think, right now, it's about confidence. It's not a tactical aspect, in my view. It's confidence. We're under-performing." "People like to say that because we had leaders before here at this club," he said. "That's also fair enough. But we were not talking about leaders when we were having an unbeaten run. It all seems as if it's based on results. If you have the results, we're not speaking about leaders. "Sometimes it's also hard to replace people like John Terry, who was captain here and a leader. It's hard. You cannot cook a leader these days. But, at the end of the day, we have to try to follow in the footsteps of these players. "It's always important that the supporters are with us. Sometimes, for example at City, you can understand that they are furious. But at the end of the day, the emotions of the fans, I cannot do anything about that. No player can. "What we can do is get back results, then they'll always be behind us. They still come to the stadium and support us, so they are behind us. It's based on our performances and the results we give. Then we will always have them behind us." "It's important for us to stay in this [Europa League] competition and fight to win it, definitely," he added. "Then, on Sunday, a big game against City at Wembley. That will show the truth. That will show our way this season."